Length: 286.5mm. Image shows assembled and painted kit. The light cruiser Mogami, lead ship of her class, possessed five triple 15.5cm gun positions and a 150,000 output that would rival even its famed cousin the Yamato - it was an ambitious attempt to shoehorn heavy cruiser armament into a slimline, lightweight hull. Later in her service life, in 1939, she was up-armed with 20.3cm guns and converted into a heavy cruiser before later joining the outbreak of war in the Pacific. The alterations to this versatile vessel didn't end there, however, and after sustaining heavy damage at the Battle of Midway in June 1942, Japanese navy planners took the chance to have her converted into an aircraft carrying cruiser while carrying out repairs. She finally met her end in the Battle of Leyte Gulf, October 1944. Direct hits to her bridge from U.S. aircraft were compounded by her colliding with the heavy cruiser Nachi, and the Japanese navy was left with no choice other than to scuttle the Mogami, the task performed by the destroyer Akebono. Thus the Mogami sank, leaving just the memory of this ship of many faces. Now, she joins the Water Line Series for the first time in her light cruiser guise. 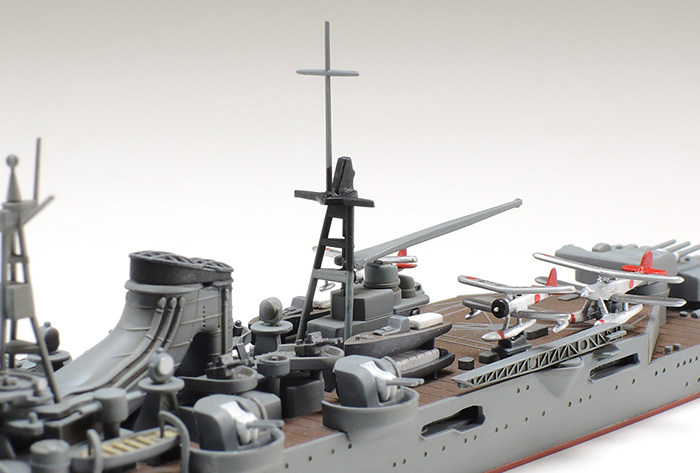 ★This 1/700 scale plastic model assembly kit recreates the light cruiser Mogami. Length: 286.5mm, width: 36.5mm. ★The compact bridge structure and unique funnel shape are reproduced down to the finest detail. ★The highly realistic hull comes in left and right halves. 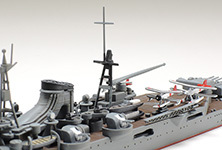 ★Armament such as triple 15.5cm guns is recreated with aplomb. 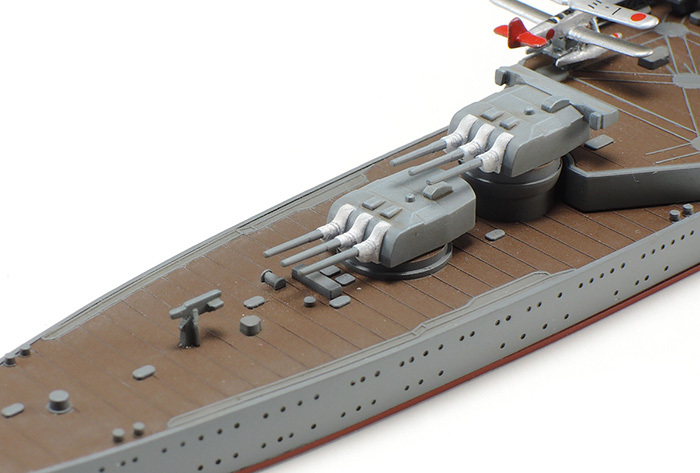 Poly caps are used in the five 15.5cm gun stations to allow their movement after completion of the model, while the direction of the four triple 61cm torpedo launchers can also be altered. 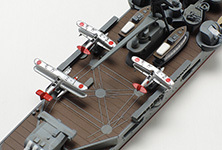 ★Details such as the tripod type aft mast and aircraft crane are faithfully depicted. ★Included Kawanishi E7K "Alf" (x1) and Nakajima E8N "Dave" (x2) aircraft add an extra layer of authenticity to the model. ★The aft deck high angle gun from her light cruiser days is accurately captured. 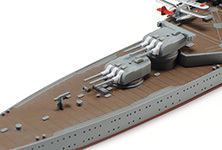 ★Admire the detail on the 12.7cm guns, funnel form, aft mast with crane and much more! ★Finely molded aft deck is resplendent with catapult and 3 tiny aircaft models. ★Why not try your hand at building the Mogami in 1/700 scale as she appeared when she was an aircraft carrying cruiser (Item 31341)? Information is correct as of July 1, 2015. Specifications are subject to change without notice.